Sugar-Project is the new CRM Open Source Theme based on and compatible with SuiteCRM. 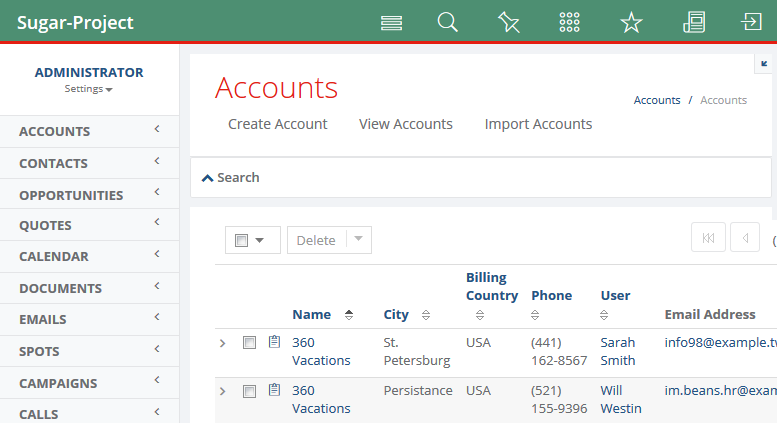 Sugar-Project offers a revolutionary new interface designed as a theme for SuiteCRM. Various new features have been added, users will definitely love them! Additional modules, new views: all Open Source and compatible with SuiteCRM. Great look and stunning features, take your CRM to a new level with Sugar-Project! Sugar-Project is a theme for SuiteCRM completely responsive and bootstrap based that comes with a great look & feel. It gives a professional business impact to your SuiteCRM and improves the user interface – Menu on the left-side, a new toolbar and DetailViews, EditViews and ListViews provided in modern style. Using your CRM on the go won’t be a problem anymore: the Sugar-Project theme perfectly fits the screens of any mobile device. Look at the great look and feel of Sugar-Project Theme and at the distinctive features it can give to your CRM in the next video. Sugar-Project has an extremely usable foldable search panel, available for both basic and advanced search. It provides a handy searching system avoiding to fill your screen with search panels. Once you are done with your searching, the panel will automatically collapse! In addition, the classic ListView layout is now more clear and easier to navigate. On each record, it provides an additional arrow on the left, which Users can click to show more fields (that you can choose from Studio!). Furthermore, the Sugar-Project Theme comes with a new feature: Sticky Notes! A simple sticky note module comes with Sugar-Project on the right side of the screen, your sticky notes will be organized in a list you can show, hide and text search through. Each User is allowed the view of personal sticky notes only. Which Edition Should I Choose? Theme Setting, to change the colors of the theme, to set the max number of items in the toolbar and in the subpanels toolbar, to choose whether to show or not the logo in the top part sidebar. Toolbar Settings, to add icons and links to the top toolbar. Subpanel Toolbar Settings, to choose the module where to enable the subpanels toolbar. Calendar Settings, to define the Calendar ListView settings (the modules to enable it in, how to show records on this view). Kanban Settings, to define the Kanban ListView settings (the modules to enable it in, how to show records on this view). ListView Grid Edit Settings, to choose the module where to enable the Grid Edit ListView. SugarPrint, a lite version of our standalone add-on. Backed by our Tried & Tested, 30-Day Money Back Guarantee. "Its clean, intuitive interface has made it easy for me to get staff buy-in on the switch over to a new system." View email messages directly in the history panel itself or detach the Emails and Notes sub panel and see them in their own separate sub panel.